The good news just keeps on coming recently! Hot on the heels of our sister hotel, The Atlantic in Chelmsford being awarded 4 star status, our Rose & Crown Hotel wedding coordinator Lisa Grantham, was also recently shortlisted for the Wedding dates Wedding Coordinator of the year award. 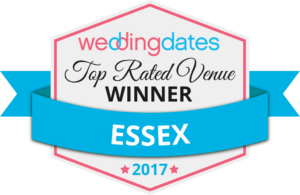 And if that wasn’t enough, Lisa and her team have just been awarded Wedding Dates Top Rated Wedding venue in Essex Award 2017! Lisa has been with The Rose & Crown since 1995 and was instrumental in the hotel winning Wedding Dates coveted ‘Top Rated Venue in Essex’ award for 2017, 2016 and in 2015 for The East of England and Essex. An award that saw us pitted against hundreds of other wedding venues in the East of England. Since joining our wedding planning team Lisa has helped more than 2000 happy couples tie the knot at The Rose & Crown. In fact, Lisa married her own partner here back in 2007. Such is her commitment to her work! Lisa’s day-to-day job involves helping couples plan every element of their Rose & Crown wedding to absolute perfection. From organising tastings and menus, to being present on the day to ensure everything runs smoothly. She even goes to the trouble of customising her shirt colour to fit in with the wedding theme! Not only is she a much-loved member of our in-house hotel team, but couples that have the pleasure of working with Lisa can’t thank her enough for her commitment towards making their celebrations a success. If you’re planning your own wedding in Essex, we offer 3 tiers of package at the Rose & Crown, as well as special winter wedding/ last minute special offers! You can find out more about our Weddings offer here. And, you never know, if you go ahead with a wedding with us, you may soon be working with the official Wedding Coordinator of the Year!